Heard about Em8er in an offchance reddit comment in an unrelated thread. I think you guys need to be much more louder! So happy to hear this happening and I wish you guys the best of luck, signed up with founder status. on it, ty and good look with new projects. I remember wishing I've gotten the founder's pack all the way back when, and now I've gone back to regretting it again since it would've meant supporting this game! This credit is not transfered to em8er, players are just awarded ingame store credit worth the same as their ff-founder pack. 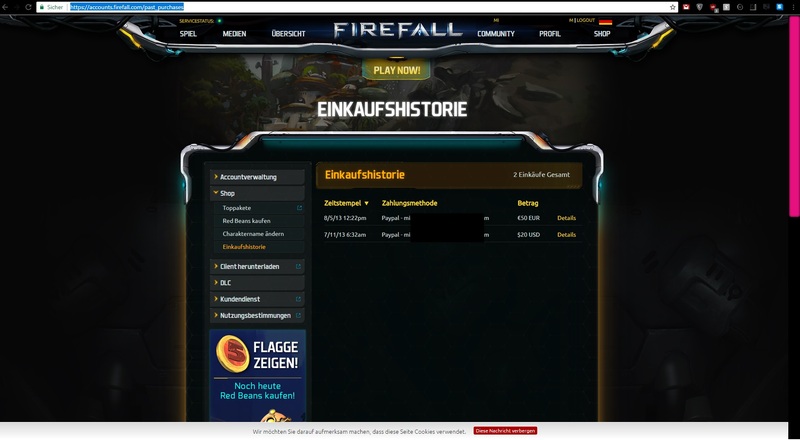 one question, here in the screenshot (I put a black box over my email adress) you can see my old Firefall purchases. I dont know, if it was different founder packages or what ever. But when i try to activate the founder Badge on "emberbot", It says " Founder badge not found "
You can check on this page if either Ensign/Lieutenant/Commander founder pack is activated on your account. I did the thing. Who even knows if I'll have time to play the game when things go live, but better to be safe than sorry. I hope we'll get some avatar-thingy for this. Crazy seeing so many OG Firefall players again. Thanks for the credit! I have to admit this is an awesome and unexpected thing. I was fully expecting nothing to ever come of my Firefall founder purchase... You know what that means though, right? That's right. I'm throwing more money at em8er first chance I get, because the Firefall I got was not the one I bought a founder pack for. This just might be it, and I absolutely want this project to succeed, on the terms set by the team behind it in the state they desire it to be in. Not what a publisher says at the last possible minute. So thanks for that. You've further reinforced my decision to throw money at the game in the future. I have real doubts that Em8er will ever be finished. Crowdfunding a bunch of micro segments of a game seems like it will take decades to finish if at all. The last crowdfunding funded one character? Seems like funding each and every character/tree/shrub/tile/vehicle/mob/blade of grass will take billions of crowdfunding initiatives. Then all these micro projects don't automatically form themselves into a complete game. Expect another few thousand crowdfunding initiatives for the actual engine/game. Thanks for the credits. Hopefully I will get to actually use them within my lifetime. Ye of so little faith in a hands free and motivated Grummz. That's why it won't be how you describe it . We are on path to build playable mockup/demo/prototype however you want to call it. Em-8ER needs to show it can deliver, it needs to build trust and backer base. By quickly delivering milestones on set path is a way to do it. There are now more than 400% more people than there were last milestone and it increases at steady pace. Mind there is no budget for marketing, all this is due to volunteer efforts, word of mouth, and articles on gaming sites here and there about vision and development progress. When there is a mockup backers can actually play with high level of polish, you can expect kickstarter for a full time company (Mark is already working on it full time). If you ask me it's way better than starting doomed to fail kickstarter campaign (not to mention I don't think Kickstarter permits projects without a working game demo). All other games in this stage of development are super secret ... Em-8ER is out there in the open from the very first steps. As more hands are brought onboard, pace will speed up. 2) A ready to go community. If any of you are interested in the dynamics of crowdfunding, look at the top ones on kicktraq.com and compare them to the failed ones. Also not the inverse bell curve typical of most funding. Most successful projects are funded in the firstk 2-5 days. If not, they tend to fail. This means baked-in community is important. If we want 10,000-20,000 backers, I'd like to grow our community from our current 10,000 to 100,000 prior to KS. EVEN AFTER RELEASE, WE GONNA NEED A BIG PLAYER SPECTRUM TO KEEP THE SERVER RUNNING. THE MORE WE CAN GET IN NOW, THE BETTER/SAFE CAN BE LATER.